The Western World, especially the United States, is largely an individualistic, narcissistic society. In applying this mindset to religious matters, the in thing is to seek spirituality in an individualistic, narcissistic way. 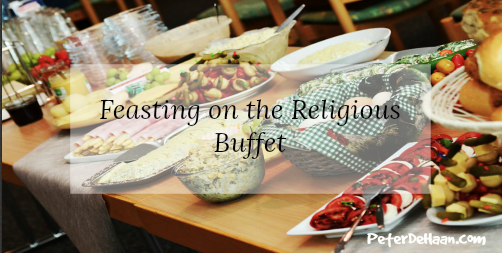 We pursue the formation of our religious convictions as if we were at a buffet, a religious buffet. We pick a little bit of one thing, try a tad of something else, combine two things that were never intended to go together, and so on. The result of our religious buffet is that we end up creating a God that is who we want him to be. We effectively make God into our image. We dumb down the divine. This is not wise, and just because we feel justified in the process, it doesn’t render the results as right or worthy. In college, I learned that there are two theories for how electricity moves through a conductor. (If you care, they are electron theory and hole theory—and they move in opposite directions.) Each has its relative merits in aiding in the understanding of all things electric, but mixing the two together only results in confusion and consternation. They are mutually exclusive; when combined, the results are untenable. Likewise, with our religious buffet is untenable. Attempting to live in a religious amalgamation won’t work. We need to pick one thing and go with it, fully and without reservation. For me, it is the God who is revealed in the Bible. Adding anything to that is only a distraction. Use the Bible as your faith foundation to pursue the God—and his Son—who are revealed in and through it.